In recent years, India's robust economic growth has aroused much talk with regards to when the South Asian country's economy will catch up with China's? India surpassed France to become the world's sixth largest economy in 2017 and is likely to surpass the UK to become the fifth largest economy in 2019, according to PwC's Global Economy Watch report. Yet, the gap between the Chinese economy and the Indian economy remains wide. Despite the economic slowdown and the impact of the trade war, China's GDP in 2018 exceeded 90 trillion yuan ($13.25 trillion) for the first time. By comparison, India's economy reached $2.6 trillion in 2017, according to World Bank's data. It can be said that with the massive lead over India, as long as China can keep its economy moving steadily, India is unlikely to catch up with China, any time soon. If anything, the comparison between the two countries in terms of the sheer size of the economy and the economic growth underlines their different economic growth stages, economic structures and growth models. During the four decades of reform and opening-up, the Chinese government vigorously developed the export-oriented manufacturing sector and was actively engaged in infrastructure construction. As a result, after 40 years of industrialization, the Chinese economy is now in an advanced growth stage, with its focus shifting from quantity to quality growth. By contrast, India chose a totally different development path decades ago. Due to its massive ethnic, linguistic, religious and cultural diversity, the nation didn't have the determination and ability to improve infrastructure on a large scale and thus had to focus on the development of its services sector, which requires minimal upgrading than infrastructure. Consequently, the Indian economy, characterized with a high proportion of its services sector and a weak manufacturing industry, is still in the early stage of industrialization. According to data from the World Bank, as of 2017, the services sector accounted for 49 percent of India's GDP, with the primary and secondary industries taking 15.5 percent and 26 percent, respectively. In China, however, the primary, secondary and tertiary industries accounted for 8 percent, 40.5 percent and 51.6 percent, respectively, in 2017. While the proportion of the services sector has increased rapidly in China in recent years, the proportion of the secondary sector has always been above 40 percent. Nevertheless, manufacturing has been gradually gaining attention in India in recent years, and in 2014, the Indian government launched the "Make in India" initiative to encourage local manufacturing development and investment. While the effectiveness of the policy seems limited so far as the share of manufacturing sector in India's GDP fell to 15 percent in 2017 from 17.4 percent in 2006, it is undeniable that the Indian economy does have some key advantages, like the demographic dividend, latecomer advantage, and an innovative private sector. For instance, demographic dividend is one of the major reasons why many observers believe India's economic growth potential is higher than that of China. According to the 2017 revision of the World Population Prospects, India has about 47.5 percent of its population below the age of 25 and 56.8 percent below the age of 35, compared to 29 percent below 25 and 46 percent below 35 in China. The median age of the Indian population is 27, compared to 37 for China. Despite the younger population, the Indian society is generally characterized by wealth inequality and low education level, which, to a certain extent, inhibit the country's economic development. Indeed, India has the conditions for accelerated economic growth, but without a substantial increase in its employment and improved distribution of economic benefits among all its citizens, the economic foundation is not sound and therefore rapid growth is unsustainable. 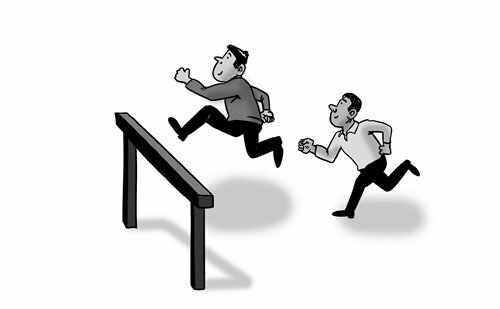 While critics like to refer to comparisons and competition between the Chinese and Indian economies as a dragon-elephant competition or a hare-tortoise race, it should be noted that the two countries enjoy certain complementary economic attributes, given their different economic structure and development stages. At present, India is committed to promoting the development of the manufacturing sector by improving its infrastructure and business environment, while China is trying to transition its economy toward a high-quality development. Therefore, it can be said that India can not only cooperate with China on infrastructure construction, but may also have the potential to benefit from the low-end manufacturing capacity shifting from China. Newspaper headline: What will the impact of an economic slowdown in China mean for India’s economy?